As promised, I have been eager to share all the details of my wedding day! I will cover everything from my dress, Cody's suit even down to the cake topper. Like I mentioned in my previous post, our wedding was quite simple. 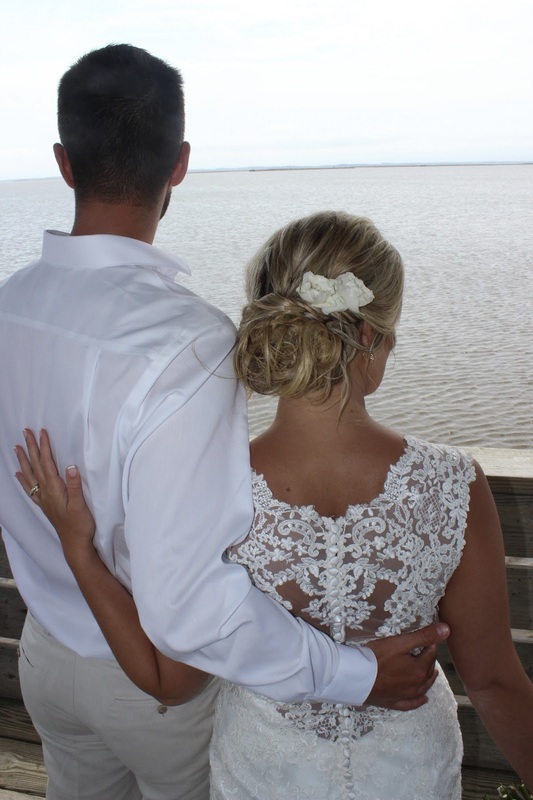 A lot of the small details were taken care of for us by the Sanderling Resort. Let's talk about my dress and his suit! All of the Dresses from Maggie Sottero are absolutely stunning. I picked out 3 different dresses while I was hunting for the perfect dress, and each of them were from this designer. I can't find my exact dress because it was purchased over a year ago, but any of her designs are gorgeous! As for Cody's Suit, again I can't find the exact one but I linked one similar. He blew me away with his choice for our wedding day. He picked out his entire outfit without any help from me. Men's Warehouse hooked him up with the outfit he had in mind and He looked incredible! As for my sandals, I found these pair off one of my favorite bridal websites! I linked the exact pair. With the idea of walking on the sand, I knew I would need a dressier pair of sandals. If these aren't formal enough, I would highly recommend them for your honeymoon! The beading detail and metals are perfection! Okay So I covered all the details of Cody and I's outfit.. Let's talk about my "bridesmaids". From the photos you can see that I didn't actually have any of the girls stand beside me on my wedding day. (Truth be told, I didn't want to have to pick anyone for maid of honor.) As gifts to my girls, I bought them each custom hangers and silk pale pink robes. As for dresses, I left each of my girls up to picking their own dresses. I said they can all do different shades of pink dresses. I wanted them to pick something they liked, and would possibly use again. Most of the girls shopped Lulu's. They have a ton of affordable fashion and perfect formal pieces. I hope you guys all enjoyed this in depth post sharing all the little details about Cody and I's Wedding day! Feel free to leave any questions down below, and I will be sure to answer each of them! Their staff was amazing, lovely and truly professional. I could go on and on about these guys. All of the wait staff at the wedding venues were great at their jobs but very warm and nice people. There is no better place in the city to get married and no better guide than their manager.